Marco Silva believes that Jordan Pickford proved his quality in Everton's win over Chelsea, following a poor display against Newcastle United last time out. Despite saving a penalty, Pickford made several errors in Everton's 3-2 defeat at St James' Park, and was fortunate not to get sent off in the incident leading up to Newcastle's spot-kick. 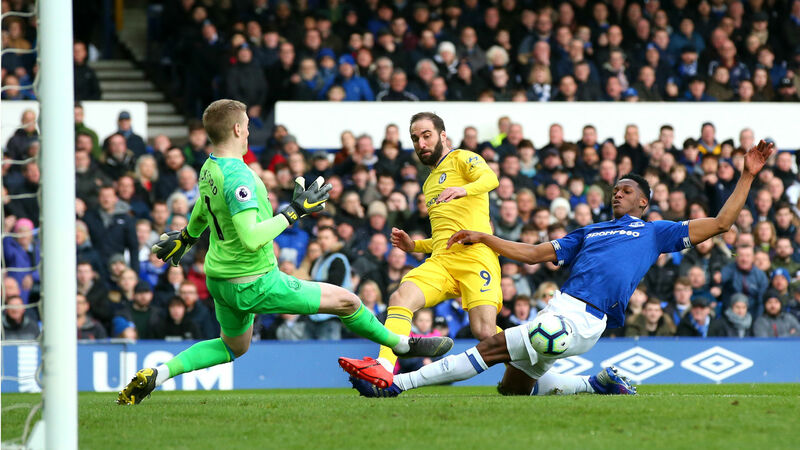 But Pickford, making his 100th Premier League appearance, put in an assured performance on Sunday as Everton bounced back with a 2-0 victory over Maurizio Sarri's side, making five saves to conserve a second successive home clean sheet. And though acknowledging that Pickford must add consistency to his game, Silva – who challenged the 25-year-old to show more emotional balance in his pre-match news conference – had no doubts that the England goalkeeper would respond well to criticism. "Jordan did really well. This season, one thing that is completely different in Jordan’s life is that he is always in the spotlight," Silva told a news conference. "This is normal as the number one of the national team and also number one for us. "He has handled this situation, performing at a high level every single game, but let me know one goalkeeper who is performing perfect every single week. "Our job, what we are doing with him, is for him to be more consistent. But he needs the team to be more consistent. It is something we are missing during this season. "If one week you have not a good performance, the next week you need to be really strong, and he showed that again, because he has the quality to be our number one and also the number one of the national team. "It is our job to work with him and learn from all the performances, good ones like today and, to be honest, bad ones like last week." Pickford had much to do in the first half, with Chelsea dominating from the off – Eden Hazard forcing Everton's goalkeeper into a smart stop before hitting the woodwork. But the Toffees rallied after the interval, with Richarlison heading in an opener before winning a penalty from which Gylfi Sigurdsson tucked home on the rebound to secure a first league win over a 'big six' side since a 4-0 victory over Manchester City in January 2017, a run which Silva insists must not be repeated. "This is something that cannot happen again because it is not a normal thing, for a club like us, not to be winning against a strong side," Silva added. "I am sure all of the managers and players who were here before did their best to achieve that, but for our quality as a club and how big we are as a club, we cannot allow that to happen again."